We’d love your help. Let us know what’s wrong with this preview of The Case Against Impeaching Trump by Alan M. Dershowitz. To ask other readers questions about The Case Against Impeaching Trump, please sign up. Having read a great deal about recent topics surrounding presidential impeachment, I thought it appropriate to explore a little more about sentiments against the constitutional removal of President Trump. There are surely many Trump supporters who oppose impeachment talk, even those not employed by Fox and Friends. However, I sought something with more teeth and legally grounded. Enter, Alan Dershowitz, who makes strong and repeated assertions that talk of impeachment is not only premature, but Having read a great deal about recent topics surrounding presidential impeachment, I thought it appropriate to explore a little more about sentiments against the constitutional removal of President Trump. There are surely many Trump supporters who oppose impeachment talk, even those not employed by Fox and Friends. However, I sought something with more teeth and legally grounded. Enter, Alan Dershowitz, who makes strong and repeated assertions that talk of impeachment is not only premature, but also legally unfounded. Dershowitz presents arguments that he makes clear to the reader that he’s held for over fifty years and offers them repeatedly throughout this tome. Interestingly enough, I have read many of the texts Dershowitz hopes to debunk with his arguments, citing that these legal scholars and academics suffer from tunnel vision and could not support their assertions if the ‘shoe were on the other foot’, one of his tests to credibility. Dershowitz, an admitted civil libertarian, extols the necessity that impeachment and bringing criminal charges against opponents should not be a club to remedy ideological differences. Dershowitz also spends much time trying to erode the entire current impeachment process as being anything but supported by law. He cites strong concern about the hiring of a special prosecutor to undertake investigations into all the alleged activities that fuel the calls for impeachment, explaining that bias has rotted the core of the exploratory system. With a less than stellar Robert Mueller, an Attorney-General in Jeff Sessions who tried to play two roles, and members of Congress who are fixated on loose claims, Dershowitz goes almost so far as to call the entire process a sham. Narrow interpretation of the US Constitution is another area where Dershowitz tries tirelessly to nullify the need for considering Trump’s actions as worthy of impeachment. A firm believer of literal interpretation of the Founders’ words, Dershowitz cannot see where Trump has done anything to contravene the limits set out by those who created the political rulebook for the United States. The repetitive nature of Dershowitz’s arguments leaves the reader to wonder why he needs to constantly provide an air of self-aggrandizement, as though others could never contribute as effectively. Dershowitz shows why he is the ideal criminal defence attorney, pushing smoke into the eyes of the layperson while concocting bouts of browbeating to confound someone who simply wants some basic arguments to offset much of what is being said in print and on television. Dershowitz is to be applauded for holding firm to his ground, but makes few arguments that come across as substantial without being condescending. An interesting read for those who can comprehend his complex and highly academic views, though sure to miss the mark for many other readers. I do not know what is more clear than Alan Dershowitz. And also more exactly to a specific point. If it is his incredible self-critical honesty within such an up front energetic personality. Or his superb logic and precise by precedent and onus defining ability. Overall his is an expression of brilliance in argument and within answer. Not just in this particular book, but it's especially evident here. And when he did this in the past for issues on the "other side"- I thought of him in exactly th I do not know what is more clear than Alan Dershowitz. And also more exactly to a specific point. If it is his incredible self-critical honesty within such an up front energetic personality. Or his superb logic and precise by precedent and onus defining ability. Overall his is an expression of brilliance in argument and within answer. Not just in this particular book, but it's especially evident here. And when he did this in the past for issues on the "other side"- I thought of him in exactly the same way too. When I was much younger I saw him speak on a case. Brilliant then, brilliant now. This entire book is clear and direct language, and yet I did not find it "easy" read as others did here. In fact, I read that first entire portion three times- it's filled with exact language coupled with 200 plus years of precedent. The first sections are Dershowitz defining and relating the process and the use of this law for precedent and in possibility within the impeachment process itself. And it includes the "living" Constitution argument used by so many progressives as their core argument (and not just for impeachment either). Dershowitz parries that "living" argument with specific proofs of why/what can be made "living"redefined and which parts by founders and present laws' passages cannot ever be redefined. They are called the "dead" parts of the Constitution. But I got my 5 star rating more from all the other sections of exact and verbatim dual argument of tangents to all this legality within the other sections of the book. And roles that other non-elected or not listed "permissions" can play against any elected USA President. Two or three of them (interviews) I saw in real time. Two of the them on Meet the Press against Todd and one against Tucker Carlson. The entire last third of the book concerns the methods that have been used and the privacy and other rights of citizens that these committees have decimated by their actions. And how FISA court claims /approvals and other aspects of all this also deserve Nonpartisan Commission investigations. And also why Mueller should never have been appointed nor used highly questionable tactics since appointment. Dershowitz also has chapters and explains why Mueller and especially Rosenstein should never have been used or appointed within these arenas at all. Especially Rosenstein should have been recused from the earliest communications because of past involvements and associated personal relationships. Alan Dershowitz also parries in the numbers of dual (live interview copy portions) TV program appearances how the "Republican" party of some of the actors in the DOJ of this long process as an answer to "fairness" is circular and ridiculous. They hated Trump from periods way before he was elected. With email and witness of purposes for future attack at that. He also demonstrates how they set up straw arguments in circular fashion such as the "Republican" one just mentioned. He names other ones that they raise consistently too. And then knocks the straw men down. He does all kinds of future "if this happens/ then that cannot happen" musings in interview and at the ending. As does he predict and explain for the roles of past President and this President in the pardoning quotients of their use (and those in office in the past too). Or within bodies that have non-elected roles, as well. This book taught me several things that I did not know at all. Especially upon the role of the Attorney General as it has existed and presently exists. Dershowitz says it is the only cabinet post that was a "mistake" by the Founders of the Constitution. And that it has never been remedied. And needs to be remedied. The Attorney General as that job has direction now- actually has two separate and conflicting purposes and fields of "oversee" within one head and that is an incorrect situation. He says it needs to be split into two separate posts as other democratic forms or republic type governmental forms have done in governments elsewhere. A "prosecution" director needs to be another separate body, apart from the main onus of the Attorney General job as assistant to the President and delegate to that authority. It's an excellent and well written and supremely exact spoken book. And not just for impeachment knowledge either. Let me preface this by saying that I am definitely not a Trump fan, and I'm very much looking forward to the day where he is no longer my president. Nonetheless, this book definitely changed my opinion of current events. It didn't necessarily move me towards being in favor of President Trump, but definitely made me more agnostic and skeptical about the entire investigation. "The Case Against Impeaching Trump" isn't so much a pro-Trump argument. Rather, it is a pro civil liberties argument and an Let me preface this by saying that I am definitely not a Trump fan, and I'm very much looking forward to the day where he is no longer my president. Nonetheless, this book definitely changed my opinion of current events. It didn't necessarily move me towards being in favor of President Trump, but definitely made me more agnostic and skeptical about the entire investigation. "The Case Against Impeaching Trump" isn't so much a pro-Trump argument. Rather, it is a pro civil liberties argument and an argument for following the actual letter of the law during this investigation. There are discussions around understanding the nuance between what is actually a crime and what "ought to be" a crime. It discusses presuming innocence until proven guilty. And it discusses different ways in which the motives of the special prosecutor might be tainted. Most importantly, these arguments aren't specific to Trump's case. Dershowitz constantly comes back to the "shoe on the other foot test". It's easy for anyone to think they pass this test, but there are so many nuanced pieces of the law that aren't reported. This book convinced me that neither party really passes the "shoe on the other foot test", and just makes me super skeptical of pretty much anything related to this investigation. A second interesting piece is to see arguments that Dershowitz makes surface in the media, for example the idea that "collusion isn't a crime". Believe it or not, that is presented as a real argument in this book. While it's certainly the case that collusion is not something you might look kindly upon, the question of whether it is legal is a valid one and it matters! I definitely agree with Dershowitz's idea that we shouldn't be stretching the law to "criminalize political differences". At the end of Chapter 1 Mr. Dershowitz introduces the concept of the Rawlsian Veil from "Justice as Fairness" by John Rawls (1985.) Conceptually Rawls argues that one should take into account nothing about the individual accused but only the crime and the evidence of that crime. With that in mind I suggest reading with the idea of a President who did certain things rather than President Trump. The essence of the book is in the first chapter. The remainder are edited reprints of other of Professor Dershowitz's writings. In my opinion The first chapter is worth the price of the book. The first chapter does an excellent job of describing the ambiguous and non-ambiguous elements of the process of Presidential Impeachment. (Or as Professor Dershowitz calls them the "living" and "dead" parts of the Constitution.) If we accept his learned opinion there is an amazing amount of ambiguity. But almost all (hedge word almost - I am uncomfortable with making an absolute statement about a topic I hardly know) of the ambiguity is process ambiguity. For example, the Constitution requires the Chief Justice to preside over the "trial" in the Senate without much is any guidance as to his/her role, responsibility, or powers. I have tremendous respect for Alan Dershowitz. He has a brilliant legal mind but more than that he is VERY fair and VERY consistent in his interpretation of the law. He is a civil libertarian who consistently votes Democrat but he does not suffer from Trump Derangement Syndrome as do many of those who share his political views. He consistently applies the same rule of law to those with whom he agrees and also with those with whom he doesn't. He doesn't defend Trump's behavior or his policies but I have tremendous respect for Alan Dershowitz. He has a brilliant legal mind but more than that he is VERY fair and VERY consistent in his interpretation of the law. He is a civil libertarian who consistently votes Democrat but he does not suffer from Trump Derangement Syndrome as do many of those who share his political views. He consistently applies the same rule of law to those with whom he agrees and also with those with whom he doesn't. He doesn't defend Trump's behavior or his policies but he does defend his constitutional rights as an individual and as president. He used to serve on the national board of the ACLU, yet expresses sincere disappointment that the ACLU seems to have forgotten its role as a neutral civil liberties organization and has become a "left-wing, agenda driven group that protects its contributors and constituents while ignoring the civil liberties of Americans with whom it disagrees." Dershowitz writes about the "criminalization of politics" and his guiding principle that the primary test for whether an argument is principled or partisan is the "shoe on the other foot" test. Dershowitz writes, "Principled consistency may be difficult to achieve, especially in our current hyper-partisan atmosphere. But if we are ever to end the partisan bickering and name calling that is coarsening dialogue and making reasoned compromise impossible, we must insist on a single standard of legality and morality that applies equally to Democrats and Republicans." Dershowitz has lost friends in New York and Martha's Vineyard for his consistency on constitutional issues and some no longer speak to him. He jokes that he has lost seven pounds on the Trump diet because he and his wife are no longer invited to dinner parties because of his politically incorrect (according to the left) views. This is a small book, only 150 pages. The nugget of Dershowitz’s explication lies in the first seventy pages. T Dershowitz pens a dispassionate, cogent, and compelling monograph that makes the legal case that the blather that suffuses through the media regarding the impeachment of President Trump is but manifestly political agitprop. He presents his thesis in the Queen’s English, instead of legalese, for the proletariat—it is easily readable and comprehensible, and decidedly politically neutral. A carefully constructed, Constitution-based argument, politics and personalities notwithstanding. What a great pro civil liberties book. Mr Dershowitz continued to make logical and understandable arguments supporting the reasons not to impeach. I am a renewed believer in our Constitution. I would like to be a believer in our government leaderships’ interpretation of the Constitution. "I am doing what the ACLU is failing to do: defending the constitutional rights of all Americans, including this president's. I would be doing the same thing had Hillary Clinton been elected president and Republicans were trying to "lock her up." He presents the legal explanation why, at this time, Trump cannot be impeached. So if you are part of the "Get Trump at Any Costs" crowd and don't want your emotion-based belief challenged by something so simple as the law, then don't read this book - even though you should. If aren't capable of listening to facts without prejudging, then don't read this book. If you have an open mind to ANY side of the discussion, and want to have a discussion without name-calling and labeling, then read this book. The first pages of Alan Dershowitz's book held a slight glimmer of hope, that a reasoned, educated, and informative argument could be made that Donald Trump should not be impeached. However, in the many pages after Dershowitz's rather strict contrustcionist rendering of the impeachment procedure against a president, the author descends into the metaphorical muck of both-sides-are-wrong-ism, ignorance as to Trump's past actions, and a generally unsatisfying intellectual argument. This book comes The first pages of Alan Dershowitz's book held a slight glimmer of hope, that a reasoned, educated, and informative argument could be made that Donald Trump should not be impeached. However, in the many pages after Dershowitz's rather strict contrustcionist rendering of the impeachment procedure against a president, the author descends into the metaphorical muck of both-sides-are-wrong-ism, ignorance as to Trump's past actions, and a generally unsatisfying intellectual argument. 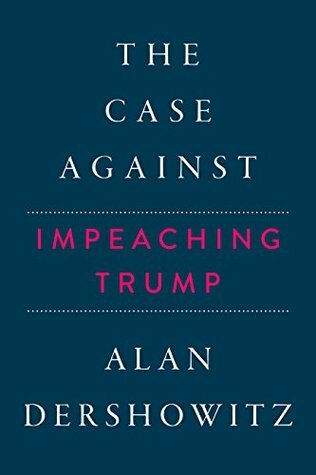 This book comes across as a series of short bursts of thoughts, but without the overarching connecting thread that is vital to make a sound case against impeachment. If such an argument exists, and it becomes less clear one does as 2019 grows older, it is unfortunately not encapsulated in this book. Dershowitz is insistent throughout his tome that Donald Trump may have acted unethically in connection with Russia, but not criminally. In fact, Dershowitz makes the bizarre case (given that he is a lawyer) that there are so many laws out there that anybody can practically be sentenced for anything! It would appear that Donald Trump is not facing some uncoordinated partisan attack, but rather a series of potential crimes well-grounded in current law and far from the norm of what presidential candidates and presidents do. Dershowitz reaps much from his argument that Trump could not possible have committed obstruction of justice, because a president has the constitutional authority to fire officials such as the Director of the FBI and Attorney General. Alas, if only it were so for President Trump. Legal commentators have made the point that the fact that the president exercised a constitutional power (such as in firing Comey) is no defense if the action was done with corrupt intent to block an investigation. Trump himself has admitted that Comey was fired because of the Russia investigation. Thus, it appears that obstruction of justice is not just some imagined crime cooked up at the DNC or in East Coast elite classrooms, but a concrete crime that can, and should, be prosecuted. Dershowitz joins a long line of esteemed commentators who declare a pox on both the houses of Hillary and Donald for the ills of the country. After all, Dershowitz argues, if Hillary had been elected, wouldn's Democrats be using the same arguments as Trump to stave off impeachment? The simple answer is: No. The Clintoin campaign did not coordinate and collude with Russia. Hillary Clinton may not have fired James Comey. Paul Manafort is behind bars; other campaign aides and friends disgraced. And yet there is no analogy with the operatives and friends of the 2016 Clinton campaign. The declaration that "both sides are wrong" is immensely dangerous to the health of the Republic. The Republican Party has become, under Trump, an anti-system, pro-authoritarian, and dangerously power-driven coterie that seeks SCOTUS seats, favorable Congressional districts, and miedieval walls on the border no matter the laws or norms. Democrats, and Hillary, are not free from blame, but they should not be put on the scales as equal belligerents as compared with Donald Trump. In conclusion, Dershowitz's book failed to persuade at least this jury of one. A better book surely exists, whether written or not, as to the long-term wisdom of whether to impeach Trump. While some interesting points are made by Dershowitz, he does not convince this reader that impeachment is unwarranted. The bad: The book is 75% articles and interview transcripts, so there is some repetition. You may have already them, but most are still worthy of a read. Additionally, because they are previously published in various news outlets, they are written in simple language, which sometimes cannot convey complex concepts well. The other bad: Prof. Dershowitz has suffered a fair amount of social ostracism for remaining principled and he does complain about this a few times. Once would be enough. Now the g The bad: The book is 75% articles and interview transcripts, so there is some repetition. You may have already them, but most are still worthy of a read. Additionally, because they are previously published in various news outlets, they are written in simple language, which sometimes cannot convey complex concepts well. Now the good: the first quarter of the book is worthy of taking your time to get through as it’s a quick primer on the Constitutional law regarding impeachment. I learned a few things I didn’t know, including the premise of his argument, that to be impeached, a President (or any other public official who is subject to impeachment) has to be found guilty of a crime. He distinguishes “political sin” from criminal acts, and maintains that impeachment is not a wholly political act (sorry, Maxine Waters!). Now, here’s where he rises above so many. He completely says that his is an outlier position, and cites the law review articles and books that argue that the impeachment process can be expanded to include all sorts of vague concepts that mostly come down to “The current President is BAD.” Okay, I exaggerate, but only a little bit. Non-crimes like collusion should not lead to removal from office, unless there is an underlying crime like treason, bribery or other “high crime or misdemeanor” attached to it. There are plenty of things Trump has done that may fall under the umbrella of political sin, and we’ll see if any rise to the level of the Constitutional mandate, but it’s good to be reminded of the difference between the two. And he’s consistent - he’s already written books against the Clinton impeachment, and says he’d be making the exact same argument were Mrs. Clinton President today with calls for her impeachment. This will be one of the most significant books I'll read in 2019. As the Democratically led House of Representatives proceeds with numerous investigations hoping to find something that will lead to Trump's impeachment and the Mueller investigation comes to a close, Alan Dershowitz produces a book that should throw a shadow on all of these efforts. What does it take to impeach and remove a President? In truth, there is little original thought in this writing. It's mostly a compilation of essays, a This will be one of the most significant books I'll read in 2019. As the Democratically led House of Representatives proceeds with numerous investigations hoping to find something that will lead to Trump's impeachment and the Mueller investigation comes to a close, Alan Dershowitz produces a book that should throw a shadow on all of these efforts. What does it take to impeach and remove a President? In truth, there is little original thought in this writing. It's mostly a compilation of essays, articles and interviews Dershowitz has written or done since Mueller's special investigation has begun, but the value is that all of these writing and interviews are brought together in one small book. Dershowitz begins this book with a 30 page essay summarizing his case against impeachment, the rest of the book is a reprinting of the writings and transcripts mentioned about above. Finally Dershowitz ends the book with a short closing argument, which restates his position. He raises several interesting questions, including the fact that the Constitution requires evidence of "other crimes or misdemeanors" for impeachment, not just disagreement with the President's policies. What if the House votes an order of impeachment without evidence of a "crime" and the President appeals the ruling to the Chief Justice to the Supreme Court, who under the Constitution presides over any impeachment process. Or assuming the Senate would approve such a measure and the President would appeal that ruling. What happens in either instance? Was there a crime? Was the emoluments enough for impeachment? DT is clearly uses his power of the office he holds but did he go too far? Is he constitutionally authorized in his actions ? We all understand he's not above the law but perhaps DT believes he is and we wonder was his actions lawful? Let us learn from one another and listen before condemning. These two latter statements I can agree upon. However, as for DT not having enough for impeachment I cannot agree. I believe ther Was there a crime? Was the emoluments enough for impeachment? DT is clearly uses his power of the office he holds but did he go too far? Is he constitutionally authorized in his actions ? I believe there is plenty of evidence to the contrary and for me it's criminal. I hold a Masters in Public Administration and Criminal Justice so I'm familiar with Case Law/Crimes Codes and all that it entails. I'm familiar with the statutes, our constitution, the laws of our great nation. I'm not seeing that no obstruction was found, in fact quite the opposite. I'm not in view of the basis for the civil liberties justice as evidenced here in this novel. However, what's great about the USA is we are free to agree or disagree based on democracy for which we have for now...who knows when it will become null and void with the propaganda now upon us along with the constant bombardment of fake news and new restraints by our increasingly overgrown government. I do believe having once married and happily divorced a malignant narcissist after 11 yrs of marriage, that the truth shall set you free. The truth will come out in due time, just be patient. The introduction is a very succinct and compelling argument against impeachment on consititutional grounds. I think that part of the book is required reading. I wish there was a little more time spent on detailing potential "high crimes and misdemeanors" as that vaguery is likely more pertinent than 'treason' and 'bribery'. Also how is that a president must first be convicted if Dershowitz also argues the DOJ practice says a sitting president cant be indicted? That point seems very circular, thou The introduction is a very succinct and compelling argument against impeachment on consititutional grounds. I think that part of the book is required reading. I wish there was a little more time spent on detailing potential "high crimes and misdemeanors" as that vaguery is likely more pertinent than 'treason' and 'bribery'. Also how is that a president must first be convicted if Dershowitz also argues the DOJ practice says a sitting president cant be indicted? That point seems very circular, though I'm unfamiliar with the legal nuances. I didn't find the morning show interviews worthwhile. I also thought the talk of Mueller conspiracies was tacky and the fixation on the ACLU out of place for the purpose of this book. But overall the constitutional arguments were tough to deny. Additionally, I think he makes a good case for Rosenstein's recusal, although the political implications would be massive for Mueller. Alan Dershowitz is a brilliant lawyer as evidenced by how he consistently supports his position by case law, constitutional knowledge and thoughtful rationale. His libertarian views are only surpassed by his “need to be right” and be the “smartest person in the room”. In the interviews cited in the book (Chuck Todd among others) he constantly interrupts the host and other guests. His need to be the “smartest person in the room” is demonstrated throughout the book by the use of pejorative languag Alan Dershowitz is a brilliant lawyer as evidenced by how he consistently supports his position by case law, constitutional knowledge and thoughtful rationale. His libertarian views are only surpassed by his “need to be right” and be the “smartest person in the room”. In the interviews cited in the book (Chuck Todd among others) he constantly interrupts the host and other guests. His need to be the “smartest person in the room” is demonstrated throughout the book by the use of pejorative language such as an individual has come around and “borrowed” his perspective or constantly reminding us he is right. The first chapter is probably the best possible argument for narrow, legal interpretation of impeachment. It just happens to ignore history and real-life behaviour. More to the point, I get entirely frustrated with the pretense that the constitutional rights are equally applied to all. They demonstrably are not. No matter how high a regard one has for the Constitution, it has been stripped of all meaning in actual implementation. I find it very hard to care if any politician is getting the full The first chapter is probably the best possible argument for narrow, legal interpretation of impeachment. This book is for the uninitiated person with little knowledge of the legal system or the nuances of the Constitution. I have heard of Alan Dershowitz, seen him interviewed on television and trust those who say he is an expert on both fronts. I found this book to be informative, slightly repetitive, timely, and thought-provoking. I enjoyed it. Not too much legalese. Worth the effort. The Case Against Impeaching Trump by Alan Dershowitz, is certainly. not one of his best books. This book is somewhat controversial because impeachment is a political act, not a legal one. I am opposed to impeaching Trump because I believe that it backfire on Democrats and make Trump into a martyr. Alan Derschowitz is a brilliant man. In fact, a little too brilliant for me in the "Introduction" of this book. After that, I was able to keep up. I think this book is good read for Trump supporters and Trump haters alike. If you're a supporter of "fairness" in America, you should appreciate this book. *What I learned from this book : I might be a Civil Libertarian. A strong discourse on the current impeachment fetish from one reasonable liberal academic. It's so easy to not like Trump in the White House, but it is only right that the lefties deal with it, and take their concerns to the polls as Americans have done for the past 240+ years. Professor Dershowitz is a brilliant legal scholar who lays out a detailed constitutional argument against some of the practices the Special Council is partaking in. He goes on to describe the constitutional limitations of impeachment. It is a great book and an easy read. This is not a pro-Trump book but a Pro- United States Constitution. Explains how we are on the edge of loosing our freedom and rights if the powers to be take the wrong course. That the ends do not justify the means. Well written. A must read by the left, right and middle. He has spent most of his career at Harvard, where, at the age of 28, he became the youngest full professor in its history, until No Alan Morton Dershowitz is an American lawyer, jurist, and political commentator. He is the Felix Frankfurter Professor of Law at Harvard Law School. He is known for his career as an attorney in several high-profile law cases and commentary on the Arab-Israeli conflict.